Brennu-Njals Saga is the longest and most celebrated of the Icelandic Sagas. 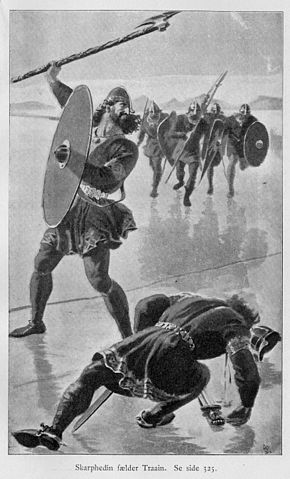 Like most of the sagas, the events it describes take place in the period 930–1030, which is called söguöld (the Age of the Sagas) in Icelandic history, though scholars have shown the chronology is as erratic and inconsistent as a Shakespeare history play and for the same reason: dates and protagonists’ ages are changed to make the storylines more dramatic. Also, as standard, though the events are set from the mid-tenth to mid-eleventh centuries, Njal’s saga wasn’t written down until towards the end of the thirteenth century (1280?) ie 250 years after the events occurred, and by an anonymous Icelandic sagaman or storyteller. It is a highly crafted text, but crafted in numerous ways we aren’t famliliar with. Many names The blizzard of names is very confusing but understanding them is vital, since most sagas amount to long, convoluted records of feuds and vendettas which span generations of numerous families, where husbands marry multiple wives, have numerous children, step-children, foster-children and adopted children. A few family trees (as in this edition) are barely enough to hold the full complexity of family relations and can be more confusing than helpful, as Icelanders had a limited number of names and no family or surnames. They take the name of their father and add -son or -daughter. Hence Thrain’s son Grim is Grim Thrainson etc. But there only appear to be about 20 names and given there are some 400 people in the text, there is a lot of duplication of names, making it challenging to keep in mind not just who’s who but what the family ties and allegiances are of the numerous Hoskulds and Thorgeirs and Mords and Grims. The glossary of names at the end of this Penguin edition is invaluable in helping you remember which character did what in which chapter, but isn’t really enough to explain who is related to who, and so doesn’t really help explain why people act the way they do. Dull prose The prose is as flat as a pancake. The action, like the dialogue, is clipped and laconic; only the absolute minimum of information is given. Description of anything at all only occurs once every 20 or 30 pages and comes like the sight of a weed in the Sahara. It is clipped, factual, bare as the windswept Icelandic landscape. But, over the long haul of this long book, the style becomes strangely addictive. There are almost no descriptions, no similes, no metaphors, little or no colour. The prose describes people doing things in the flattest most factual manner imaginable. But it gains power. A long book about killing The subject matter is men killing other men. In fact, in Njal’s Saga it’s men killing other men and then going to the Althing, the national court, to negotiate the complicated legal settlements which Icelandic culture offered between murderers and the victim’s family. In the first half of the book Njal is a wise lawyer who can fix any murder-related mess. From one angle, Njal’s Saga is a kind of Icelandic John Grisham, with some very long and quite tense courtroom scenes. The Law In the sagas – written down in the solidly Christian culture of the 1200s by literate men who were either monks or got their education from monks – almost all traces of paganism have been removed. Instead, and maybe this does reflect the Iceland of the time, there is a massive emphasis on the Law, on legal procedures and negotiations. The events of Njal’s Saga are punctuated by the annual visit by all the characters, by all Icelandic men it appears, to the annual Althing or national court or legal convention. First there is an isolated killing in a field or in the woods or by a river. Then the lengthy negotiations at the Althing where, in the first half of the tale, Njal advises Gunnar who always emerges with honour. Violence is quick Unlike in the movies, the violence tends to be quick. One blow is generally enough, sometimes two, to kill a man, especially if you’ve crept up on him unawares. Only rarely is there a ‘battle’ ie a fight involving more than two men, and these stand out, like the Battle of Rangver River where Gunnar and his two brothers hold off a force of thirty, or the climactic battle at the Allthing when negotiations break down. No paganism If you go reading sagas looking for any signs of paganism you will be disappointed. There are hardly any references to priests or temples or rituals or sacrifices. There is a little folk superstition, for example characters sometimes foresee their futures in dreams, and everyone is fatalistic – ‘If that is my fate, so be it’ – but these attitudes could and do survive in nominally Christian countries today. In one scene Killer-Hrapp pulls the idols out of a temple and rips off their gold and one of them is a statue of Thor. That’s almost the only reference to pagan religion in this long book about a pagan culture. Christianity Chapters 100-105 describe the arrival of Christianity in Iceland in the form of the missionary Thangbrand. Two things are striking: 1. How quickly the new faith is accepted by these sturdy heathen men. 2. How violent Thangbrand is. He kills men in duels, kills a poet, kills a berserkr. His isn’t a religion of pacifism and forgiveness. His God is simply stronger than the pagan Thor. He wins fights, he converts. The burning of Njal happens after the Conversion. All the protagonists go right on killing each other for the slightest reasons. The culture, the feel of Christian doctrine, only has a little influence right at the very end of the text, after both the surviving protagonists (Kari Solmundarson and Flosi Thordarson) have completed arduous pilgrimages to Rome and, finally arrived back in Iceland, embrace and forgive each other. Now why couldn’t they have done that several hundred blood-soaked pages earlier?